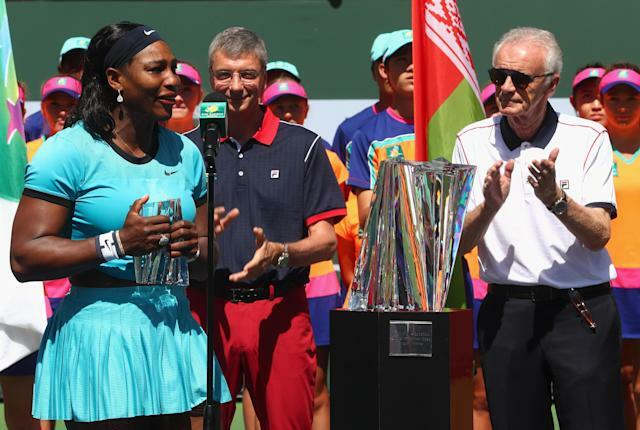 INDIAN WELLS, Calif. – Rogers Cup Toronto tournament director Karl Hale said Indian Wells CEO Raymond Moore shouldn’t have said what he said about women’s tennis. But he hopes those who are quick to judge will take a deep breath and consider the 69-year-old’s entire body of work. “His comments for sure were inappropriate, especially in this day and age. We have to go towards equality and promote women in sports and all aspects of society,” said Hale, whose tournament is also a Masters 1000 series event and who meets regularly with the other tournament directors, including Moore. Hale, a self-professed peacemaker by his Jamaican nature, has a well-established track record of support for the women’s game. He has close relationships with many of the players; indeed, he just returned from building a school in Jamaica with his charitable foundation; on the construction crew was one … Serena Williams. But he’s also a pragmatist. Perhaps unlike any other market on the professional circuit, women’s tennis is hugely successful in Canada. Unlike the other joint events, the Rogers Cup is a “virtual” joint event; the women and men play in separate cities, separate venues, alternating each year, during the same week. The attendance figures – the drop-off between the women’s and men’s events are similar, but the Montreal attendances are regularly much higher ¬– regularly set new records for one-week women’s events. “Women’s tennis is an integral part of our business; we couldn’t be successful without it,” Hale said. But … the two events don’t offer equal prize money, as Indian Wells does. So is the praise disingenuous? Not really; there are practical reasons for it. At Indian Wells, and this week in Miami, the men’s event is a Masters 1000 (where all players who earn direct entry by virtue of their ranking are automatically entered, which means everyone from the top 10 on down). For the women, it’s aPremier Mandatory; that means the player commitment from the WTA Tour is everyone in the top 10. The Rogers Cup is a “Premier 5”; the player commitment at that level is for seven of the top 10 players, although obviously it can exceed that. Long-time Canadian tennis fans will remember those years a decade ago when so many of the top women players were no-shows, the depleted playing fields hurt attendance in a major way. Things have improved measurably on that score, but the quality of the field still isn’t guaranteed to be as sterling, therefore the WTA formula doesn’t mandate the same level of prize money from the event. Worth noting as well is that while Sportsnet reportedly owns the rights to the WTA Tour in Canada (on the English side), part of its deal when it took over the Rogers Cup, it shows very little women’s tennis at all outside the annual one week made-in-Canada event. Fans enjoying the BNP Paribas Open this week couldn’t fail to notice that even Canadian star Genie Bouchard couldn’t get a second of airtime, while the ATP Tour stars got more than their share. That’s likely to stay the same for this week’s Masters 1000 tournament in Key Biscayne, Fla. Outside the Rogers Cup and the Grand Slams (which are broadcast on TSN), it's slim picking, even for a player with the profile Bouchard has. That coverage gap, which is hardly unique to Canada, is one of the factors on the anti-equal prize money side of the ledger. Whether it’s financial, whether the networks feel there is legitimately a lot less interest, or whether there are Ray Moores in the television network boardrooms making those calls, is a topic for another day. There have been rumblings that Tennis Canada might consider bumping up the women’s prize money to achieve parity, in recognition of the important part the women play in the success of the overall event and, as well, to create great optics on the equality side. Hale said that’s not on the table at the moment. “At this time we’re happy with the way it’s working. There is no discussion at this time about moving to a Premier Mandatory. We would have to go through the WTA Tour for that, and they would have to okay it,” he said. “The Tour wants to balance the schedule so when you have events that go outside it (as the tournament in Dubai does, for example, offering prize money far beyond its classifications) it can affect many things, including the player flow. “They might play more tournaments (because of the money), and that can lead to more injuries,” he added, noting that there are many consequences to that sort of change that fly under the radar but nevertheless can have a domino effect. Unlike Indian Wells, which is owned by billionaire Larry Ellison and this week’s event in Florida, which is owned by sports agent conglomerate IMG, Rogers Cup isn’t a privately owned event. It’s owned and operated by Tennis Canada, whose principal mandate is supposed to be development of the game across all levels in the country. The difference in prize money involved to achieve parity at the Rogers Cup is significant. The total prize money for the men’s event in Montreal a year ago was just under $4.7 million US. For the women, it checked in just under $2.4 million US. It’s a big gap, and that’s money that would go to wealthy tennis players rather than to grassroots development. That’s a tough budget item to sell. Hale noted that the topic of equal prize money probably hadn’t been in the spotlight this much in years, perhaps since Wimbledon became the last of the Grand Slams to achieve parity in 2007. It’s an ongoing issue, though, as ATP No. 1 Novak Djokovic was clearly stumping Sunday for the Indian Wells tournament to get a promotion to a superior, as-yet-uncreated category that would bump up prize money even more. A statement on the Moore situation was finally issued by the ATP Tour late Monday afternoon. In it, not only does it refer to Moore by his first name – a level of familiarity that likely is not unintentional –¬ it makes a between-the-lines point that while it supports equality as a concept, the WTA Tour is very much a separate entity and has little to do with them. As for Moore, he’s still on the job as of late Monday afternoon. But he is not out of the woods. WTA Tour CEO Steve Simon, whose initial, late-in-the-day official comment Sunday about his long-time former Indian Wells colleague (Simon had Moore’s job before he left to run the WTA Tour late last year) lacked punch and heft, told the Telegraph Monday that Moore’s comments were in breach of the Tour’s code of conduct and that the tour’s board of directors was reviewing them. The Tour could suspend Moore from anything related to the WTA Tour, as it did with Russian Federation president Shamil Tarpischev in 2014 for his derogatory comments about the Williams sisters. But the Indian Wells event will roll along just fine without his day-to-day involvement. And as a founding member of a tournament that was in danger of extinction not so long ago but is not a crown jewel, Moore is a favourite son around these parts, so it’s hardly a game changer. At best it would be a cosmetic move, one that doesn’t erase the ripple effects his comments have created over the last 24 hours. Moore opened the Pandora’s box of tennis equality once more, and the story likely has quite a few more chapters left.